This evening after dark look in the west to find a lovely waxing crescent moon in front of the constellation Gemini, also known as the Twins. 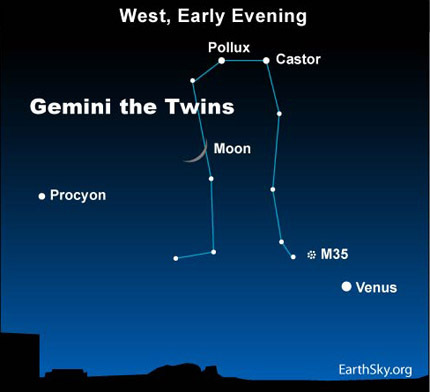 The Gemini Twins – Castor and Pollux – stand upright upon the horizon at early evening. As evening deepens into late night, Gemini slowly but surely sinks beneath the horizon, to disappear from the sky by around 1:00 a.m. tomorrow morning. Can you identify the stars Castor and Pollux in the sky? It’s easy. No other pair of stars is so bright and close together. They almost look like a pair of eyes staring at you. These two stars represent the twin brothers in ancient Greek mythology. Note that these stars shine in two different colors: golden and white. Binoculars will help you see the colors more easily. Also, with the naked eye or binoculars, note the rather faint star immediately above, or to the upper right, of tonight’s moon. That’s the star Wasat, which pretty much locates Pollux’s belly button for you. When you use the telescope, you will discover that Castor has another star that appears close to it. This companion star is known to astronomers as Castor B. However through spectroscopy – the splitting of starlight into its component colors – the two stars that make up Castor each have been discovered to be double as well. So the single point of light we see as Castor is at least four stars. Though Pollux appears to be more solitary, with no large stellar companions, it is one of the many stars in our galaxy now known to have a planet orbiting it. While you have your binoculars out viewing the colors and companion star to Castor, swing back to the moon. When it is a young crescent moon like it is tonight, it is the best time to see craters along the terminator line, or the day/night line on the moon. Through binoculars, you may also spot a fuzzy patch to the upper left of the dazzling planet Venus. This is M35, an open cluster of stars. These sibling stars were born from the same cloud of dust and gas some 100 million years ago, swarming together at a distance of about 2,800 light-years.